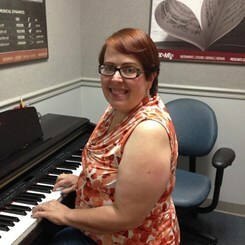 Lori studied piano (theory, music appreciation and took lessons) and voice at Indiana University. She was a accompanist (piano) for the Hoosier Heartland Repertory Theater for 3 years. She played the role of Maria Von Trapp in "The Sound of Music" for the Hoosier Heartland Rep. She has performed (piano and voice) at many weddings and events. Lori's philosophy......"I've have taught students from the age of 5 to seniors and I believe that learning a musical instrument is beneficial at any age. Playing the piano works every area of the brain and teaches discipline, patience and self-confidence. I endeavor to learn each student's musical interests and to teach each individual in a style that works best for them." Request Lessons with Lorinda today!